What Makes Calm My Pet Essences Different from other Pet Calming Aids? 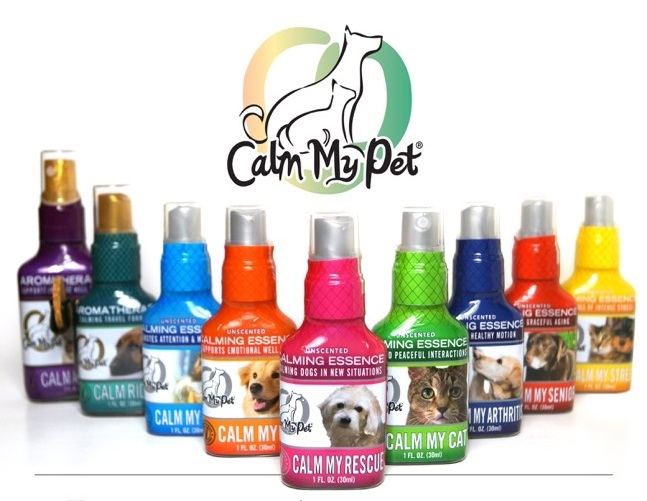 Calm My Pet products are certified organic and handmade by holistic veterinarian Dr. Fisher in North Canton, OH. Our seven unique essences are completely unscented, containing no alcohol or glycerin. These essences are tasteless and easily accepted by all pets. These are not aromatherapy or herbal remedies. Our Essences start to calm and balance pets in a few minutes and additional benefits are seen with continued use. They are made with plants, flowers, trees, gemstones, color therapy and balanced energy infused in spring water. 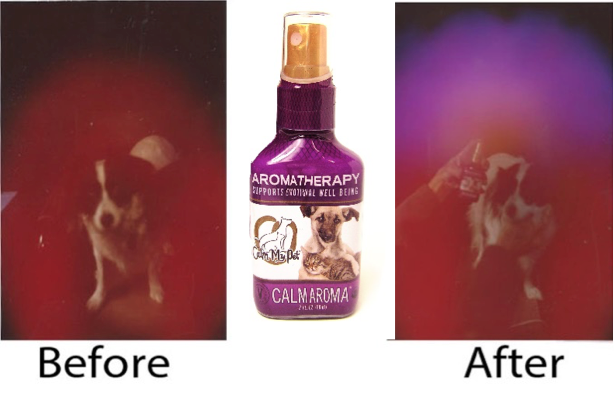 These are called “vibrational essences” and are the cutting edge of natural calming products for the pet industry. In a survey filled out by our customers, 91% stated that they intended on purchasing one of our unscented essences again. *Percentage is based on the amount of customers who answered the question. This can be contrasted with standard drugs which only work on an average of 70% of the time. 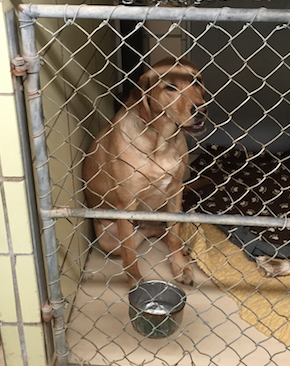 In an introductory study at a full, noisy boarding kennel, twenty four of the dogs were tested with Calm My Stress. Monitoring of stress symptoms were observed before and after misting Calm My Stress over these dogs. STUDY GROUP: The 24 dogs studied exhibited 69 symptoms of stress when initially observed. Out of these 69 behavioral symptoms noted, 90% were reduced or stopped within 10 minutes after using Calm My Stress on each dog. Positional postures monitored, after being misted, included 13 dogs who laid down and 7 dogs that sat from a standing, pacing or jumping original position. CONTROLS GROUP: Eight of the above dogs were first used as controls with 23 behavioral symptoms noted. They were misted with plain water with a 12% reduction of symptoms. There was no change in 78% of the symptoms with 13% worsening of behaviors. Positional changes were monitored where 2 laid down and 1 dog sat afterwards. 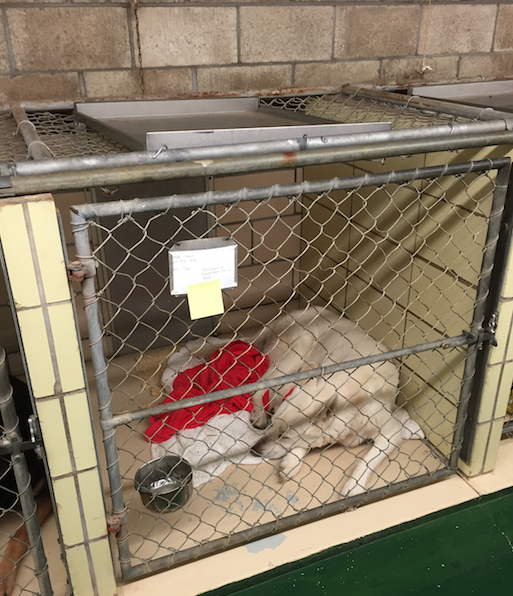 CONCLUSION: This preliminary kennel study showed a 90% of the behavioral stress symptoms were reduced or stopped in 24 dogs after misting Calm My Stress Essence. We sent Calm My Stress to an independant lab to evaluate. 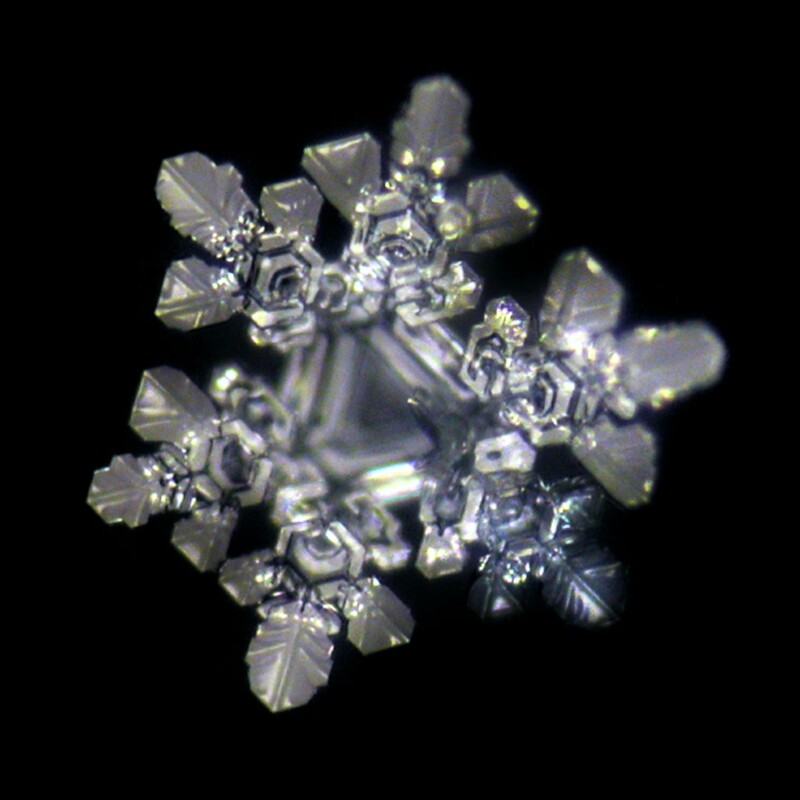 Our flagship essence went through a process of freezing and thawing under controlled conditions and then observed under a microscope for energetic crystals that formed. 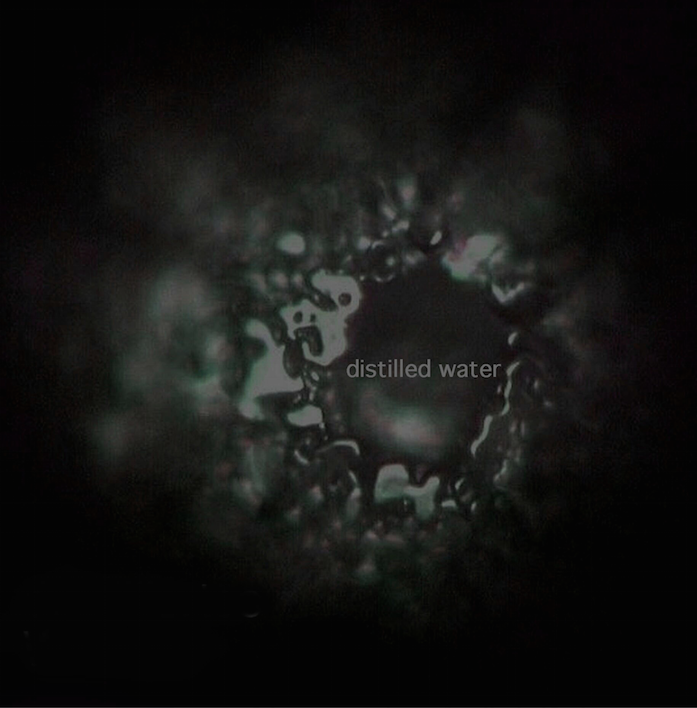 Below you can contrast the crystals of our essence (created from the energetic ingredients), with standard distilled water where no crystals are formed. 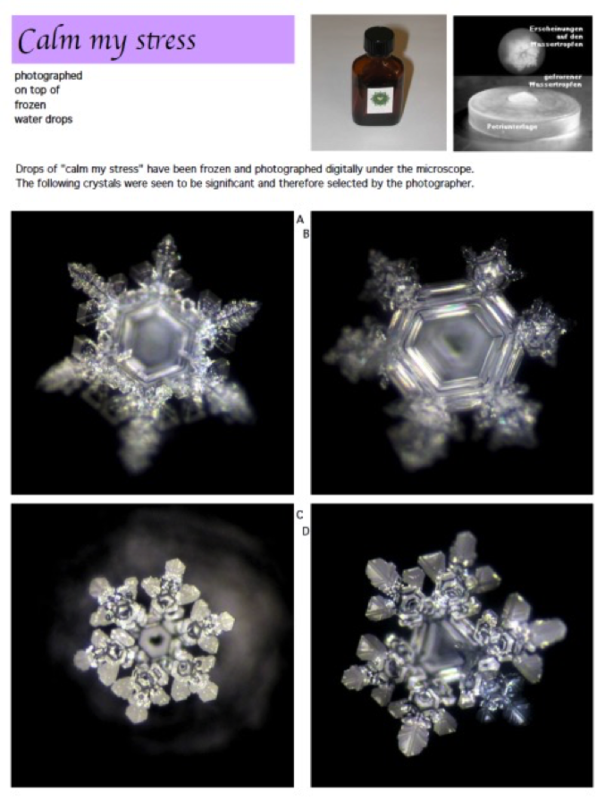 One can visually see the water energy change into crystals patterns in our vibrational essences.